I used to always eat a version of this tart during our summer vacation in South of France when I was a kid. So when I had kids myself, I thought this would be a fun way to get them to eat tomatoes. Even though my boys swear that they hate tomatoes, they love this tart! Let the dough get to room temperature. Wash the tomatoes and slice them. Preheat your oven at 425F. Once the dough is easy to unfold, place it on a baking sheet, make sure it is nice and flat and arrange the tomato slices, leaving 1/2 inch border all around. Sprinkle the thyme, 1 tsp of salt and 1/2 tsp of pepper and drizzle olive oil. Add the chopped basil. Put in the oven for 30-35 minutes until the dough gets nice and golden. Serve and eat warm or at room temperature and maybe add a nice green salad as a side. This is my favorite recipe! Easy and delicious. Thank you, thank you! I put it back for you 🙂 My pleasure! 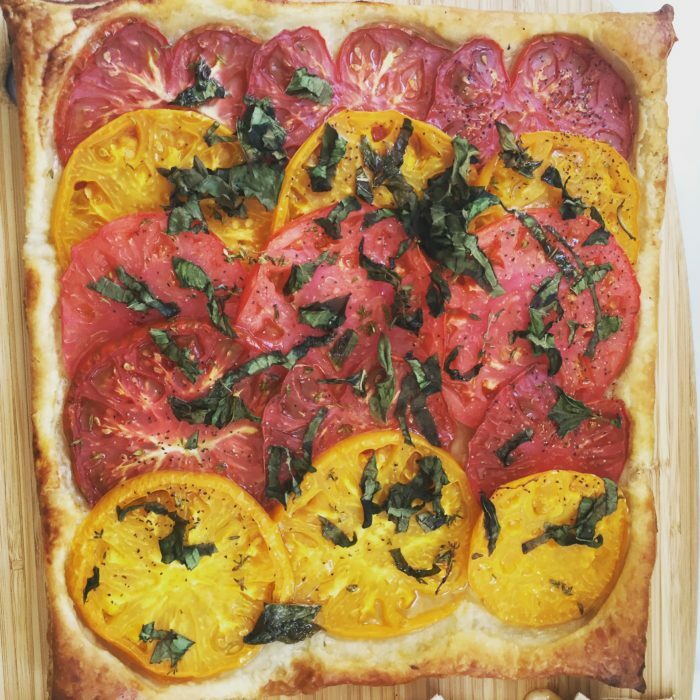 Tomato tart is one of my favorite and this recipe makes it so easy and good!